In a cellular universe the story takes an unexpected turn and reveals a counterintuitive relationship. Most believe in the superficial harmony of a universe that seems to be expanding —of a universe involved in a harmonious Hubble expansion. Others hold that the universe is not expanding and that a deeper, superior, harmony rules and accounts for not only its grand structure but also for the unity of the opposites of gravity and Lambda. THE RANGE OF GRAVITY. One of the key differences between the conventional cosmology of universe-wide expansion and the new cosmology of cosmic cellularity involves the range of gravity. Conventional cosmology, popularly called the Big Bang, permits the effect of gravity to have an unlimited range; the New Cosmology, in contrast, imposes a strict limit to gravity’s reach. In the Big Bang (BB) model of the universe every particle, every star, and every galaxy has a gravitational influence on every other particle, star, and galaxy. Everything “pulls” on everything else in accordance with the inverse-square law. For example, the gravitational pull of our Sun on a distant object decreases with the inverse of the square of the distance; as the distance to the object approaches infinity, the strength of the Sun’s pull on it approaches zero. But it never becomes zero. It means that conventional gravity’s reach has no limit. In terms of general relativity we would say that the Sun’s matter curves space (or spacetime) and contributes to the curvature of the entire universe. However, this is not the case in our Cellular Universe. The reach of gravity of any particle, star, and galaxy has strict limits. CAUSE OF GRAVITATION. There is another important difference. Often overlooked is the fact that neither Newton’s theory of gravity nor Einstein’s general relativity theory includes an all-important cause of gravitation. Newton’s gravity theory describes in mathematical terms the forces in a gravitational system —but not what causes the forces. The question, “What causes matter to grab a hold of other matter?” is left unanswered. As for Einstein’s gravity theory, although it uses a more advanced mathematical method (something called metric curvature) to describe the gravitational effect with admirable precision, the causative mechanism by which matter attracts other matter is, once again, absent. Remarkably, both of these famous gravity theories are incomplete! ... In the second year of the present millennium the cause of gravitation which had eluded theorists for centuries was discovered by an Australian physicist. This remarkable achievement may yet become known as the greatest astrophysics discovery of the present age encompassing the 20th and 21st centuries. (The cause was also found independently in that same year, 2002, during the development of the Dynamic Steady State Universe theory.) And here is the big difference: BB cosmology has not yet incorporated this key component. The New Cosmology makes full use of the cause of gravitation. Before describing the mysterious Lambda effect, the key role of gravity must be emphasized. Gravity is, because of its cumulative nature, far the most powerful effect in all Nature. For an understanding of the Universe, there is nothing of greater importance than a comprehensive fully-functional theory of gravity. The description of gravity is critically important because, whatever it may be, it ends up at the very heart of the theory of the Cosmos. Consequently, if one’s theory of gravity lacks a causative mechanism then the associated universe model will be flawed, or incomplete at best. GENERIC LAMBDA. The lack of a modus operandi for the gravitational force of Newton’s theory, or the lack of a physical meaning of positive curvature of space of Einstein’s theory, did not in any way prevent cosmologists and philosophers from constructing models of the Universe. But the problems were formidable. For one thing, ‘limitless’ gravity, it seemed, was too powerful. Almost invariably, theorists found that they needed to tame this universal and domineering ‘force’ tending to crush everything in the cosmos into some doomsday black hole. Such unrestricted gravity would preclude any sort of realistic functional universe. In the attempts to address this problem, theorists over the years have postulated various ways of counteracting the effect of gravity. They have, at one time or another, invoked: a new force, some mysterious energy, a dynamic effect, and more curved geometry —all with the express purpose of opposing gravity. And they all share a wonderfully simplifying commonality. The variously proposed opposites of gravity all produce the same result as can be had with what is loosely referred to as space expansion. Each could be replaced by some appropriate degree of space-medium growth. Space, or space-medium, expansion is like a generic cosmological constant (the "cosmological constant" being the famous factor used in the first general-relativity model of the universe). In the light of "space" expansion the cosmological constant or Lambda loses much of its mysterious nature. It is equivalent to a straightforward concept. Lambda, symbolized by the Greek letter Λ, is the generic name herein given to any cosmic phenomenon that opposes gravity. And as it is applied to the various posited opposites of gravity, it really doesn’t matter how "space" is defined. Generic Lambda simply means there is more and more of it. If we think of gravity as decreasing the space between cosmic objects, then Λ is the effect increasing the space. HISTORIC EXAMPLES OF USE OF LAMBDA. Lambda made its first appearance in 1917 when Albert Einstein used it in a failed attempt to model a static universe. At that time in the history of the science of cosmology, the universe was believed to be static on the large scale. In his famous universe model, based on his recently developed theory of general relativity, the generic Lambda was called the cosmological constant. It functioned as a new kind of force —a cosmic repulsion effect. Since Einstein denied (or ignored) the existence of a space medium, he found it necessary to create this new effect. Nevertheless, his Λ force, as it tended to increase the distances between galaxies, behaved exactly as if space itself was expanding. The model had generic space expansion. So why didn’t the model work? It didn’t work because it involved an unscientific extrapolation. General relativity, it must be understood, is a powerful mathematical theory of local dynamic space —not universal dynamic space. General relativity is not a theory of the universe and cannot serve as such. Whenever attempts are made to substitute general relativity for a theory of the greater universe, that is, whenever it is applied to the universe as a whole, serious problems arise. Thus, when Einstein used the relativity theory to formulate his 1917 model he needed some contrived component to give it stability. And so he introduced his cosmological constant as a precise counterbalance to all the gravity present in the universe. The picture that emerged was one of gravity and Lambda in opposition: Gravity struggles to pull everything in the universe together; Lambda strives to push everything in the universe apart. But the picture failed, stability was not to be had, and Einstein eventually abandoned the model. Others followed the lead of Einstein and throughout this period and into the 1920s generic Λ became a central ingredient of various universe models. The Willem de Sitter universe (1917) used Λ as the expansion of flat (non-curved) space. Alexander Friedmann (1922 & 1924) had his own version of a generic Λ; he called it space curvature and used it to produce a “space curvature” expansion of his universe (and in another version he used Λ to produce a “space curvature” contraction). It did not represent space-medium expansion in the absolute sense, as it does in the Dynamic Steady State Universe (DSSU) theory, but rather, it modeled the expansion of the esoteric kind of space used in Einstein’s general relativity —a geometrically dynamic curved space, a purely mathematical space. But no matter, the results are the same as if the medium itself expands. LAMBDA WAS USED TO MODEL A BIG BANG. Georges Lemaître, instead of aiming for harmonious stability in the universe, gave Lambda the upper hand. In his universe (1927-29) Λ overpowers its dynamic opposite. Lambda reigns, gravity submits. While gravity as usual pulls everything in the universe together, Λ works even harder pushing everything apart. By “everything” we are referring to the big stuff like galaxy clusters. Net result? ... A really big universal explosion. LAMBDA WAS USED TO “CORRECT” MAJOR PROBLEMS WITH THE BIG BANG. As detailed in the historical records, the Lemaître big bang had big problems. Some of these were of the worst kind —outright paradoxes! And so, generic Λ was called upon “to save appearances” as it were. After considerable trial and error, several American cosmologists, including Alan Guth and Paul Steinhardt, and Russian experts, notably Andrei Linde, came up with a new and improved expansion mechanism —a reformulation of generic Λ which became known as inflation. They devised a supercharged Λ-effect with super-fast space expansion. Hypothetically, Inflation dominated the earliest epoch of the BB universe to such an extend that gravity’s role was practically negligible. We now move ahead a few years. With the Crisis of 1998, Lambda took on the role of dark energy —the mysterious force causing an unexpected renewed phase of, you guessed it, space expansion. LAMBDA’S MANY GUISES. A quick review of Lambda’s better-known manifestations. It appears as an anti-gravity force in the 1917 Einstein static universe. In the Friedmann models, Λ takes the guise of space curvature. It appears as a hyper-lightspeed explosion under the dictates of Inflation theory. And sometimes it appears in the equations describing a universe model just in case it is needed; the model might not actually need Λ (i.e., it is set to zero) but it is retained and serves to represent some unknown force that just might permeate the cosmos. In some theories Λ morphs into something called quintessence. And under the auspices of current orthodoxy in cosmology, Λ rules as a mysterious force appropriately called dark energy. It stands for the unknown, spiritual element that the scientist desperately hopes will make each cosmological model more beautiful, more complete, more true. In some theories Lambda shares properties with vacuum energy. Then there are theories in which Λ is named according to its physical characteristics: negative pressure and, equivalently, tension. Not surprisingly, a region of space that is subjected to negative pressure EXPANDS. A region of space that is subjected to tension EXPANDS. In the end, whatever one may choose to label it, generic Λ is a necessary ingredient and serves as the counter-effect to gravity. And Λ in the DSSU is no exception. Throughout the 20th century and into the present, the conventional view on gravity and generic Λ has been two-fold: First, they were considered to be opposites with gravity tending to pull things together and Λ tending to push things apart. Secondly, they were seen to be in conflict with each other. The traditional view has been that of two opposite effects in conflict. This view is embodied in BB cosmology. It may seem an oversimplification, but this assessment is fundamentally sound; the Big Bang universe is a construction in which gravity pulls everything radially inward and Λ, as a cosmic repulsion, pushes radially outward. A schematic representation of this view is shown in Figure 1. Although the drawing suggests the presence of a center-point, one need not be presumed; with or without such a center, gravity and Λ are viewed as opposing each other. Figure 1. Gravity and Lambda are treated as forces in opposition by the 20th-century cosmology. As a representation of reality, the Big Bang view —to put it bluntly— is wrong. Although it is true that positive-valued Lambda behaves as a cosmic repulsion it does not follow that it also acts in opposition to gravity. Astronomers and theorists, unaware of the non sequitur, have long assumed that the two effects oppose each other. Unfortunately their traditional view of opposites in conflict leads to an unanticipated riddle. Put yourself in the shoes of a physicist. The traditional view leads you to believe that Λ opposes gravitational clustering. But by failing to recognize the invalid premise and accepting it into your model you will have immediately burdened yourself with an artificial mystery. Allow me to explain. By placing gravity and Λ in conflict with each other you are in effect weakening the force of gravity; weakening the tendency of galaxies to cluster; weakening the cohesion that binds clusters and superclusters. Consequently, you will now be confronted with the task of explaining what in the world ... what in the name of heaven ... keeps any galaxy cluster together? Astronomers have accumulated abundant observations and theorists have the detailed calculations and together they have a sea of data that embodies the mystery: galaxy motions within a cluster are far too high; the cluster should be flying apart! Individual galaxies should be fleeing the cluster. But they are not. What is it then that holds the cluster together? The insurmountability of this problem is so enormous that should you manage to discover the cause of cohesion while retaining the above premise, then expect to receive a communiqué from the Nobel selection committee. Evidently, something must be maintaining the integrity of the clusters and superclusters. Something is holding them together and their observable self-gravitation is insufficient for the task. Something mysterious is augmenting gravity. And what better way is there to solve a gravity mystery, at least within the traditional storyline, than with some kind of unseen mysterious material? ...[M]odels worked a lot better if they added certain kinds of unseen material, or “dark matter,” into the mix. Dark matter could provide the extra gravitational pull needed to build galaxies and flatten out [i.e., reduce expansion of] the universe, and if its properties were just right, it might not interfere with the [other aspects of the BB model]. The mystery material was ... designed to amplify rather than counteract the pull of gravity. Nonetheless, the dark matter search goes on, because without dark matter our picture of the universe makes no sense. Visible matter alone cannot explain the gravitational dynamics of galaxies and clusters of galaxies. Undoubtedly something is assisting gravity. ... It is not dark matter. But wait. There is something more —something unexpected and sinister, in this sub-story of conflict. Standard cosmology has added a new dimension to the alleged conflict between gravity and Λ. With the Crisis of 1998 it was found that Λ does more than simply reduce the effect of gravity —it was determined, or so they claim, that Λ completely overpowers gravity. Λ now becomes the dominant force in the BB universe; and not just during the big bang genesis but forever after. This new enhanced Λ-effect is the reason that the revised model is often called the inflationary-BB-accelerating universe —with the new emphasis on accelerating. The conventional view that gravity and Λ are opposites in conflict will now be challenged. If one is looking for conflict in opposites, one may miss seeing their harmony. A simple question: Can two opposite effects amplify each other? Consider an example for which the answer is obviously no: the two opposite parts of a propagating wave —crests and troughs. In the simple interference patterns of light or water waves, the crests and troughs just cancel each other; there is no amplification. Next, consider positive and negative electrical charges; they are obvious opposites. Depending on the configuration of their associated electric fields they may either cancel their combined effect or they may amplify the effect. For another example consider the opposite poles of a magnet. A pair of “U” shaped magnets, when aligned to demonstrate mutual attraction, represents a configuration of opposites acting in harmony. Hidden in the configuration of our dynamic steady state universe lies the harmony between gravity and Lambda. These opposites do amplify each other. As we have seen, Lambda involves the dynamic expansion of "space" and ordinary gravity involves the dynamic contraction of "space." (These are basic Postulates #1 and #2 of DSSU theory.) They appear to be, and really are, opposite effects. And you will agree that in regions of expansion galaxies move apart and in regions of contraction galaxies move closer together. It certainly sounds like these "forces" are in conflict. And yet it can be shown —and this is about as magical as the story gets— that Lambda and gravity are actually oriented in a common direction. Both effects work towards a common purpose and a common outcome. On the size-scale of greatest importance —of greatest importance for shaping our Universe— Λ pushes matter together while ordinary gravity (as always) pulls matter together. This harmony of forces is made graphically clear in Figures 2 and 3. The unexpected twist in the story of Lambda and gravity is that the acceleration vectors and the flow lines, which define these effects, are all directed towards the same regional destination! A LOOK AT THE COMOVING TRAJECTORIES IN THE CELLULAR UNIVERSE. The scale of importance in the DSSU is the scale of its bubble-like cosmic cells which have a nominal diameter of 300 million lightyears. I have used hexagons as the schematic representation of such cells. The actual cosmic structures, in general, have a non-Platonic dodecahedral shape. We may think of the flat hexagon as being the cross-section view of a polyhedron (dodecahedron). The space medium within the cell is dynamic and when we imagine sprinkling galaxies into this region —like sprinkling bread crumbs onto the surface of a lazy stream or like blowing bubbles into a gentle breeze— they will comove with the medium into which we have placed them. The motions of the “sprinkled galaxies” become comoving trajectories. The trajectories coincide with the Λ and gravity vectors/flowlines in the diagrams. Consider, for the moment, the situation in which all the matter in the universe was somehow evenly distributed around the perimeter of each cosmic cell. Then the Λ-effect and gravitation effect and the resulting trajectories would be represented with a simple radial pattern as shown in Figure 2. Figure 2. Opposites in harmony. 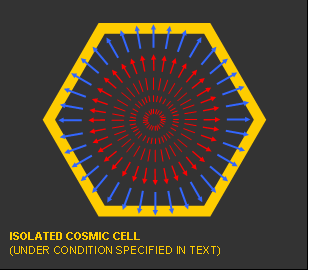 The arrows represent the direction of the Lambda “force” (in red) and the gravitation “force” (in blue) under the unrealistic condition in which matter is uniformly distributed within the cell walls (yellow). The arrows also serve to indicate the direction of movement of "space" itself and the comovement of contained objects. Matter, however, is not evenly distributed. Like a beehive honeycomb the cell ‘walls’ at midpoints have very little material, while the cell nodes are substantially reinforced. Matter, mainly in the form of galaxies, tends to clump together at the cosmic-cell nodes —as astronomical observations confirm. These accumulations are naturally called galaxy clusters. Away from the nodes we have the cell walls, or cell interfaces, which contain considerably fewer galaxies. And these galaxies are in transit towards the nearest node. In fact, it is the law of cosmic motion that all galaxies obey regardless of where they originate or where we may place them in our diagram: all follow a trajectory towards the nearest node (allowing for the occasional momentary detour and the possibility of galactic cannibalism). Once again, we are able to underscore just how strongly divergent the two cosmologies really are. In the DSSU the Lambda effect actually reinforces gravity! No mathematical proof is required; simply look at the drawing (Figure 3) and visualize force vectors (or simply acceleration vectors) along the curved paths. The Λ-effect vectors are in the same general direction as the nearest vectors representing the gravitational effect. In the DSSU, objects subjected to either Λ or gravity will move in the same general direction. On the cosmic-cell scale, the Λ vectors are directed towards mass-concentration regions, as are the gravity vectors. “[T]here is one way in which wisdom can be achieved, and that is by grasping the underlying principle of things. This formula is the harmony of opposites, but men do not recognize it, though it manifests itself everywhere. ... If we do not recognize the formula then no amount of learning is going to be of any use." Einstein was correct in principle when in 1917 he envisioned a universe in which Λ would exactly balance the effect of gravitation keeping the universe motionless (non-expanding, non-contracting). It was the pattern of the balancing dynamics that eluded him. I do not make the following claim lightly, but it seems that it never occurred to Einstein that he could have used Λ —even kept it positive— to assist gravity and still have achieved the realistic goal of a static universe. His balanced static universe was not a success. The way Λ was used turned out to be a formula for instability. If Einstein, however, had fashioned Λ into a simple cellular pattern he would not only have modeled a truly stable and quasi-static universe, he would also have discovered the real universe —the Dynamic Steady State Universe. The quest for dark matter will continue. It will continue mainly for two reasons. First, the unexpected discovery will be ignored and even suppressed. Secondly, research into dark matter is funded by government and quasi-government institutions; funding decisions are influenced by factors often far removed from truth and reality. For the foreseeable future expect more of the same —more speculative mysterious-matter theories. Nevertheless, there are profound and far-reaching implications in the discovery that gravity and Lambda act in harmony. For instance, consider the unusual symmetry pattern (Figure 3) of the Λ-gravity field? ...Without going into detail in this short article, it simply means that the largest individual gravitational fields in our Universe are not spherical; which in turn means that the usual inverse-square law does not apply. If we define the force of cosmic gravity at any point in space as the mass of a test particle multiplied by its comoving acceleration (realizing that the comoving acceleration is towards the cell interface in general and the nodal dominant galaxy in particular), then could we not simply combine expansionary Λ and contractile gravity into something called a unified-cosmic-gravitation? Any point we may wish to investigate in a typical cosmic cell is accelerating (meaning that the space medium is in motion) towards the interface and towards the nearest node! Indeed, all points “experience” gravitation as defined; all locations except for certain Lagrangian neutral sites. Lambda can simply be incorporated into a unified gravitation field. 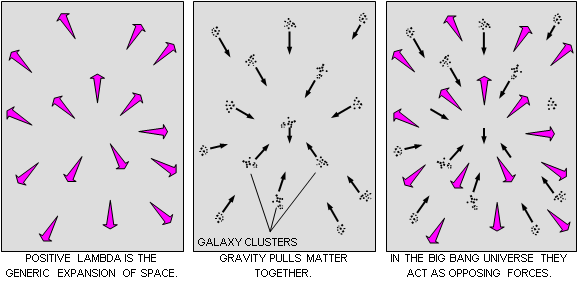 Each node with its galaxy cluster becomes the center of its own unified gravitation field. The implications are explored in greater detail in a related research paper. The symmetry partly revealed by Figure 3 may be expressing another way: All centers of gravity are surrounded by Λ regions. Consequently, we conclude that the range of gravity is indeed limited (as claimed in the opening discussion). Furthermore, the universe is not random or chaotic. Gravity and Lambda manifest as the two dynamic processes that order the universe. The order of processes imposes the order of structure. The harmonious activity of expansion and contraction mold our ordered Universe —our cellular Cosmos. In the DSSU we see the ultimate in balance between gravity and Λ. We see this clearly in our minds because we grasp the underlying principle that Λ manifests as the expansion of "space" and gravity manifests as the contraction of "space." It is a balance that maintains our Universe’s observed structure. They are two sides of the same coin. What academic cosmology sees must, of course, conform to the established BB religion. As Corey Powell effectively argues, its congregation deifies Lambda as the Angel of Dark Energy. First, the Big Bang religion provided its followers with a creation story in the form of an exploding egg (or singularity, if you prefer); the Angel of Dark Energy now provides followers with a doomsday scenario —a prolonged demise in which Perlmutter and Schmidt’s speculations of accelerated expansion leads their universe towards increasing emptiness and death by dilution. Academic cosmologists envision a rather gloomy future. All the while the practical crisis is very real, for what has a beginning must also have an ending. The adherents of the creationism cosmology, having failed in unraveling the mystery of their creation event, now brood over the gloomy fate of their universe. What a blockbuster story gravity and Λ is turning out to be! The story is leading to what must surely be the death-blow crisis for creationism cosmology. The following chart provides a convenient comparison-summary of the ideas herein covered. Figure 4. The role of Gravity and Lambda for two radically different cosmologies. 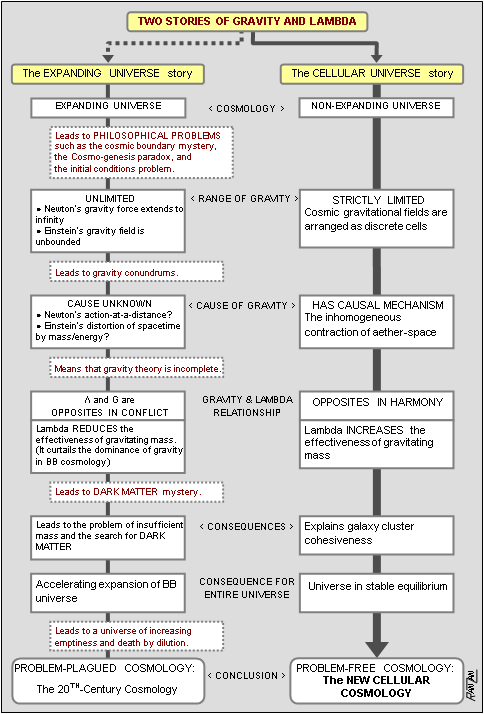 In stating, in the Figure-4 flowchart, that Einstein’s gravitation lacks a cause I mean that there is no ‘mechanism’ (for lack of a better word) to explain how mass distorts, or curves, Einstein’s spacetime. The conclusion that the 20th-Century Cosmology is a problem-plagued cosmology encompasses both the Big Bang class of models and the historic Steady State class. According to general relativity theory, gravity and Lambda are the active dynamics of spacetime. According to DSSU theory gravity and Lambda are the active dynamics of aether-permeated space. Both theories have gravity and Lambda as similar effects of their respective space. Both theories identify the dynamic effects with expansion and contraction. So, what’s the difference? Opposites in conflict versus opposites in harmony. Reprinted by permission of Physics Essays Publication, from Physics Essays, Vol.23, No.1, pp75-87 (2010). This article is an open-access article distributed under the terms and conditions of the Creative Commons Attribution License (http://creativecommons.org/licenses/by/4.0/) which permits unrestricted use, distribution, and reproduction in any medium, provided the original work is properly cited.